The LIVE Arcade GameStick pack comes complete with a 48 hour Xbox live Gold Subscription and the following Xbox live arcade games: Frogger, Astropop and Time Pilot, to get you started; all of which can be downloaded from the marketplace within a few minutes. If you add the price of these arcade titles together it would of cost you 1,600 points (approx £14), so already, before I’ve even got it out of the box, it’s looking like it’s money well spent. The first thing that I noticed, after nearly impaling myself on a pair of scissors whilst trying to open the plastic packaging (why oh why do companies do this? ), was that the controller is wired. Considering the arcade stick originally retailed at almost £50 I had expected a wireless product, but it’s not really an issue because the USB cable does have a break away attachment should you inadvertently yank it out of your Xbox 360 and the cable was long enough (approx 10ft) to comfortably reach all the way to the settee. 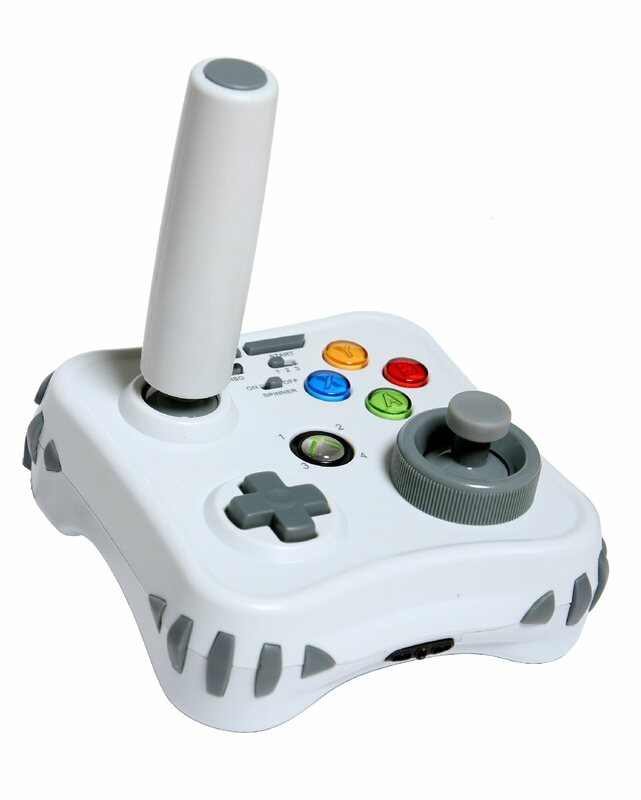 The lightweight white plastic controller merges all of the Xbox 360 buttons onto its face and throws in a few new features. The result is a fairly compact and busy looking controller that sports the standard A,B,X,Y buttons, a back and start button and the Xbox 360 guide button. In addition there’s a full sized manly 3.5 inch joystick which sits on the left hand side of the pad (sporting a fire button), a right analogue stick, which is surrounded by a trackball-replacement spinner, a simplified version of the standard Xbox 360 d-pad, and a programmable turbo button. On the exterior of the stick there’s a jack enabling you to plug your headset in and on the North outer-side of the pad there are four bumpers that act as the two bumpers and two triggers that you’ll find on the standard Xbox 360 controller. Design-wise the controller could be better. If you’re right handed and grasp the left analogue stick you’re occasionally hampered by the right analogue stick brushing against your palm, so at times, you have to maneuver your hand at an unnatural angle to avoid it. It’s a small irritation, but one that could have been avoided if the layout of the pad was slightly different. When you hold the arcade pad with both hands on your lap it feels comfortable and it's a snug ergonomic fit, but you’ll find that you need an extremely long thumb to be able to reach the fire button on top of the joystick comfortably. This isn’t a problem when you’re playing the likes of Time Pilot, which is a fine example of how well the controller works, but in games where you need to use the bumpers on the back of the pad it does feel slightly unnatural. However, the problem of having short thumbs isn’t an issue if you’re willing to place the Arcade stick on a table. The pad feels solid standing on a table thanks to the rubber grips underneath which prevent it from moving whilst you’re playing and it’s by far the best way to use this arcade stick.